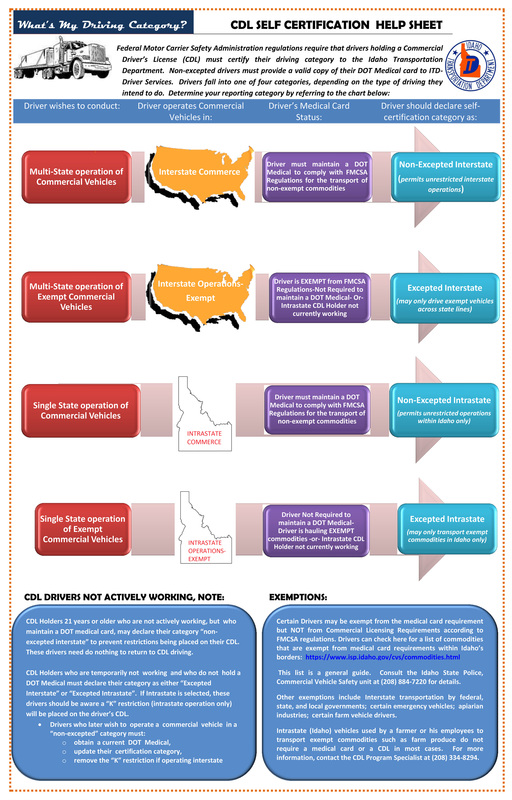 The purpose of this site is for Idaho Commercial Driver’s License (CDL) holders to declare a driving category as to whether driving interstate or intrastate, and to declare whether driving for a purpose that requires a medical card or not, as required by Federal Motor Carrier Safety Administration (FMCSA) regulations. This information will be retained by the department to administer future notifications to driver's regarding medical card requirements. If your driving category changes, you may return to this site at any time to update your driving category. If you are not sure whether you need a medical card, click this PDF / Image before you report your driving category.